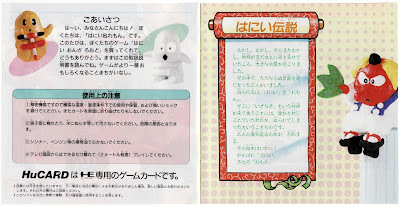 After thinking about it for quite some time, I've come to the conclusion that the manual made for FACE's weirdo platformer, Hany on the Road, is, without question, among the best ever produced for the PC Engine. Thankfully, those same clay figures (or at least I think they're clay figures) appear throughout Hany on the Road's manual, as is evident from the very first pages (such as the ones below). Another thing I'm thankful for when it comes to Hany on the Road's instruction manual: It features (in the lower-right corner of the following page) a modeled-out-of-clay 10-ton weight. OK, so the crying dragon--also made out of clay, of course--is kind of cool, too. The designers at FACE resorted to good ol' drawing when they whipped up the next two pages, interestingly enough. 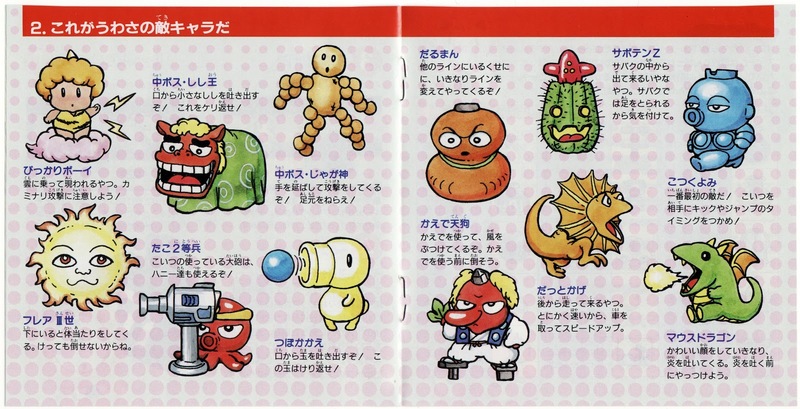 Normally I'd wish they had stuck with their clay models, but I'm refraining from doing that here because the illustrations below are pretty top-drawer (in my opinion, as always). I'd like to note, by the way, that the little orange-haired dude who's riding a pink cloud and producing lightning bolts with his fingers is my favorite character in the game. Anyway, enough about that. 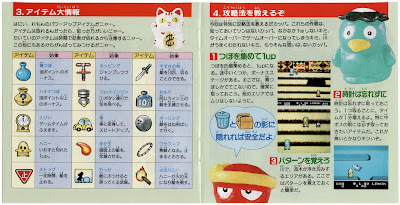 Hany on the Road's manual ends on a somewhat ho-hum note, as I'm sure you saw when you scanned the pages above--which seem to showcase the game's many items (including the aforementioned 10-ton weight). 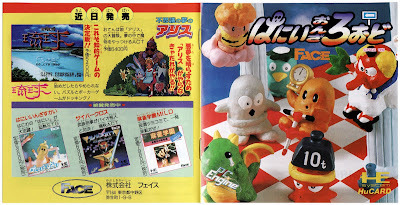 That is a really lovely manual - I miss the time when games developers used to make models for things like this, like the puppets made (apparently by Shigeru Miyamoto himself) for Starfox. 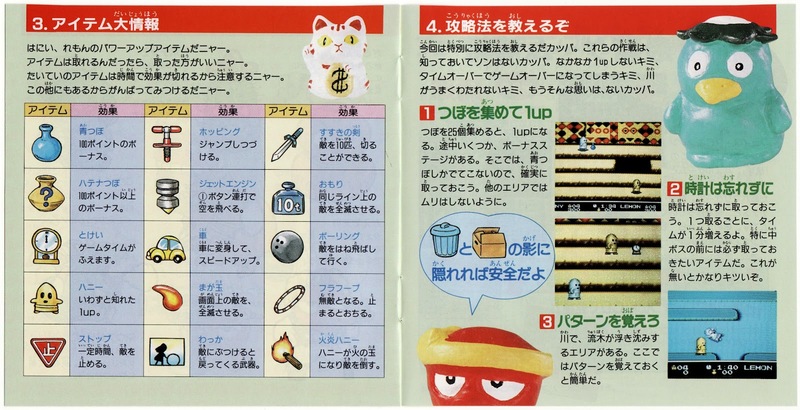 Hey there, VGJUNK! Thanks for stopping by :) I'm with you, BTW -- I also miss when devs would go out of their way to make awesome stuff like the clay models that appear in this manual (or the ones that appear in the Mother manual). Oh, well, at least we'll always have the ones from the 8-bit and 16-bit eras, right? 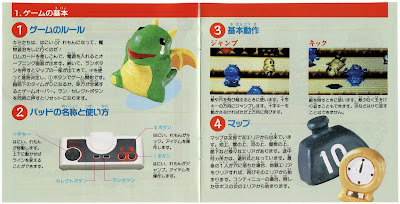 I have this game too and agree about the cover art on the manual, that 10t weight made of clay is fantastic. Another thing that I really like about PC Engine manuals is that they have ads for other PC Engine games on the back cover. For some reason I just like that. You have this game, Sean? That surprises me! I thought you only had a few PCE games? If that's the case, I'm guessing you were drawn to this one's cover art? 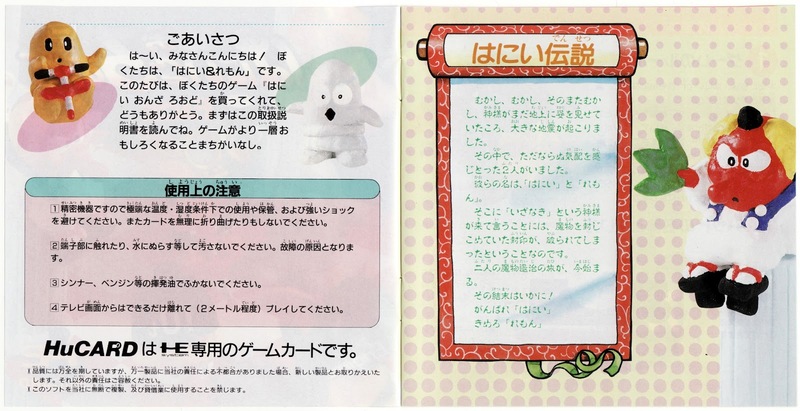 Also, you're right about some of the PCE game manuals having ads for other PCE games. Kind of weird, IMO, but also kind of cool. Not all of them have this, of course, but quite a few do -- at least in my experience. The manual is gorgeous, so I decided to download and play the Hany last night. It was kinda fun, but really hard. For some reason the "continue" made me go back to the first level, so I never got far. Anyhow, I made a gif. Hey there, warp! Yeah, I guess the game can be difficult. It's definitely one of those old school games, though, that benefits from a bit of practice. I had to play the first few stages quite a few times before getting a good feel for it. I love Hany's little flip kick, BTW (the one you featured in your gif).